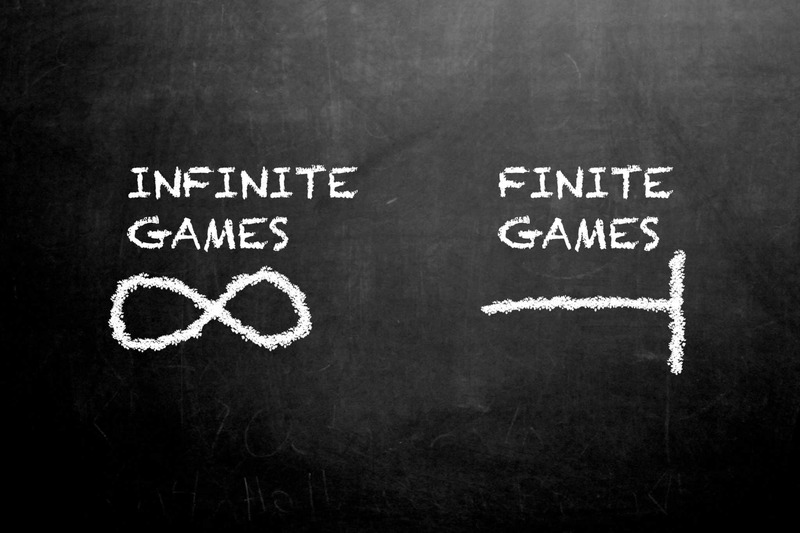 Infinite games are games where the objective is to excel and to pursue a worthy goal over the long term. Finite games with set structures and a winner/loser are limiting and ill-suited to long-term success. These two ideas are encapsulated in Simon Sinek’s book The Infinite Game and Sinek’s ‘infinite’ mindset is very similar to what we believe good crisis management looks like. Considering this approach will help you succeed in your overall goals and during a crisis. In crisis response, as in business, we often hear or employ metaphors around war or sports such as “we need to go from defense to offense” or “we need some air cover”. Unfortunately, these ideas relate to ‘finite’ games, situations where there are a clear winner and loser which often isn’t the case in a crisis. However, I was recently introduced to a book which suggests we move away from the idea of winners and losers, zero-sum or finite games, in business and instead think about ‘infinite’ games. In his book, The Infinite Game, Simon Sinek differentiates between finite games – games where we have known players, fixed rules and a winner and loser – and infinite games where there are unknown players, changing rules, and the goal is to keep playing as long as you can. Sinek points out that businesses, or governments, that engage in finite games can be tactically successful but still fail strategically because the opposition simply outlasts them. Groups that engage in an infinite game, playing to advance a just cause, have greater longevity and success. (Watch Sinek deliver a summary here). This got me thinking about infinite game thinking in the context of crisis response and what we can learn from Sinek’s ideas. Very often in crisis situations, it is simply a matter of survival to get through the situation. This would appear to be something that is like a finite game because we have to ‘win’. The impact of losing is unacceptable and even the status quois a distraction that keeps the business from doing what it must. However, whether this approach is right or not in a crisis is what’s interesting to me. So are crises finite or infinite games? I don’t think Sinek has changed the way I think about crisis response but I think that his five key rules for how to play an infinite game are highly relevant. Moreover, I think that approaching crises as infinite games gives you a greater chance of long-term success versus simply achieving a tactical win. The first rule is to have a just cause. You must stand for something that matters, articulate those ideals and ensure that everyone knows what it is you stand for. This is vital to ensure that people behave and act appropriately and knowing what you believe in is critical if you’re going to be able to articulate your story to the public. This is perfectly aligned with our crisis equation where understanding your mission, values and what you stand for, allied with a clear chain of command equals speed of trust. A clearly articulated just cause and well-understood values are also at the heart of ethical decision-making, further increasing the relevance of this idea to effective crisis management. Sinek next talks about courageous leadership. Courage is what is required when companies make a mistake because we have to own up, apologize and fix it. That takes courage, particularly saying sorry, and again this is something that we’ve written a lot about. But organizations have to be equally courageous if they make a strategic decision and need to explain it better and stand by it. They need to have the courage not to retreat on an issue because it was received badly by the public. Or the company did a poor job explaining it. If it was a good idea, one that was well-reasoned and of strategic importance, then we should have the courage to defend it while we maintain empathy and are considerate of those in opposition. The third requirement is a trusting team. Sinek uses United Airline and the unfortunate incident where a passenger was forcibly removed from a flight as an example of a situation where trust was severely lacking. Interestingly, that particular situation with Dr. Dau was something we looked at in detail and was even the subject of our 2017 Kith Christmas card because of all the ‘things not to do’ lessons we drew from it. Sinek makes the point that United employees feared getting in trouble more than not exercising their judgment. Sinek contrasts United with Southwest Airlines where everyone feels supported and trusted. This means staff feel safe to use their judgment which improves the passenger experience and thus benefits everyone. Anytime staff fears using their judgment because they might get into trouble is a time where you don’t have a trusting team. This would be fatal in a crisis where decision-making will stall and you will lack credible, confident storytellers who can explain what’s happening to build trust and allow you to move forward. Fourth, Sinek cites the need for a worthy rival in a finite game as you need this to force you to improve. This differs from simply beating a weaker opponent in a finite game where you are focussed on winning. Sinek notes that a worthy rival will force you to improve, mature and develop as you play the infinite game, even if you lose some matches along the way. I do not simply believe that the media, plaintiffs attorneys, elected officials or regulators are rivals in the sense that we are trying to beat them. Rather, to Sinek’s point, we play ‘against’ them and while they try to advance their own ‘just cause’, they force us to be better. A competitor or other firm which excels in the face of adversity might also be a worthy rival: someone who will make us better and force us to do things that we might not have done if we had been left to our own devices. Lastly, we need a flexible playbook for an infinite game which is also critical in a crisis situation. In a crisis, we can’t operate with a fixed playbook because we need to take varied inputs and understand what’s going on where every situation is different. This is where the infinite game of crisis different from the finite game of operations. A successful product roll-out playbook is well-worn because it works and can be used over and over again. There is some room for flexibility and creativity but, for the most part, roll-outs are fixed. Compare this to a crisis where every situation is different, every part moves and the situation is changing constantly. Remember,white binders are your enemy in a crisis. So as I think about infinite versus finite games in the context of crisis situations, I don’t believe that we fundamentally need to change the way that we operate. However, I think that having an infinite game mindset is highly relevant and advantageous for a crisis manager. Moreover, this is a mindset that will help you as a leader at all times. Dare I say it, it might even help you avoid some critical moments in the first place. As with the Hippocratic Oath –“first do no harm” – keep the crisis adage of “let’s not make it worse” in mind. If you want to manage things in a finite way, to win the crisis at hand, that’s okay. But you don’t necessarily want to play simply to win. You want to keep playing forever, to grow and expand and to become a dynamic organization. One that has a clear notion of mission and values plus a clear chain of command equaling speed of trust in a crisis. Keep the five ideas of an infinite game in mind – a just cause, courageous leadership, trusted teams, finding a worthy rival and having a flexible playbook – and see how these could benefit your organization before and during a crisis. And if you haven’t had an opportunity to check out Sinek’s book, here’s a link to it on Amazon. Like his other books, Start with Why and then Leaders Eat Last, it’s an interesting concept and an enjoyable read.